Starcast: Salman Khan, Anil Kapoor, Katrina Kaif and Zayed Khan. 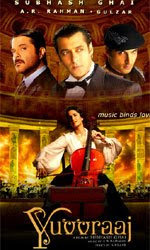 Subhash Ghai is yet again bringing a musical story in a theater near you on November 21st, 2008. Produced and directed by Subhash Ghai, “Yuvvraaj” has an impressive star cast including the real life romantic duo, Salman Khan and Katrina Café along with Zayed Khan and Anil Kapoor. “Yuvvraaj” is a movie about three brothers and their father, who dies seeing that all his sons have lost the family values and treat each other as partners and not as brothers. Watch out how Katrina comes in between as a musical melody to bring the three brothers together in a family bond in the Bollywood movie “Yuvvraaj”. Like many other Subhash Ghai’s movies A.R. Rehman has composed music for “Yuvvraaj”. All the songs for this much-awaited movie of 2008 have been penned down by none other than Gulzaar. In this movie, you will also get to see Mithun Chakraborty in a special role and Boman Irani in a cameo role.